To the shock of most of my left-leaning friends, I purchased a $15 one-year membership to the Conservative Party of Canada, despite the fact that there’s no guarantee that I’ll vote for them. I’m under the impression that when someone says they’re “liberal,” it’s unlikely that there will be much of a reaction in the room. When they say they’re a “card-carrying, capital ‘L’ Liberal,” people react like they’re part of a cult. I’ve seen posts on social media suggesting that people who join a party can’t think for themselves, blindly follow the party and support absolutely everything they do, and are impervious to other ideas. This is nonsense. You can be a life-long NDP voter and still think the party was better when Layton was around. When the Conservative leadership race was getting started, I found myself revolted by Kellie Leitch due to her positions on immigration, as well as the idea of Kevin O’Leary, a reality TV star, becoming a major party leader in my country. The bigger reason why I joined the Conservative Party was to vote for Michael Chong. Even if I don’t vote Conservative in the next election, if the right-leaning party of Canada is offering to do something about climate change, it alters the political landscape. Chong probably won’t win the leadership race, but I hope to communicate to the party that climate change needs to be taken seriously, and multiculturalism needs to remain integral to Canada. Unlike in the United States, it’s actually much easier and more convenient to influence party leadership races as a private citizen. In the States, they have primaries with different states going first, and some having votes and some having caucuses. Some parties have superdelegates, candidates needs to spend hundreds of millions of dollars, and it’s a huge headache. 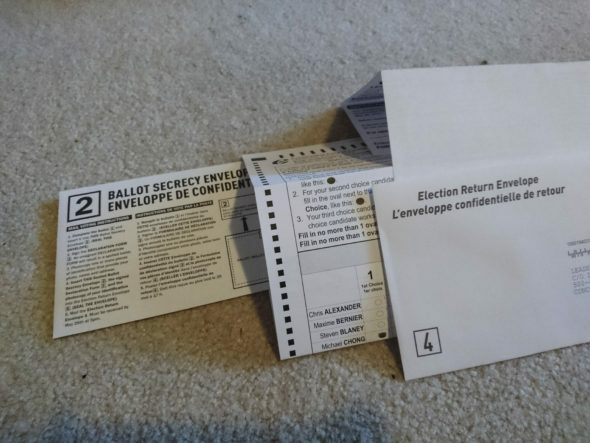 As a Canadian, all I had to do was fill out a form mailed to me with my preferences for party leader. I got to rank my preference, not tick off one box, which admittedly is a bit strange coming from a party that likes first-past-the-post. Party members also have the option of going to an office to vote if there’s one nearby. You get to have more impact since there’s a barrier to entry to participate in some political parties. Since the Liberals recently made membership free, my vote will be one of 250,000 members. While the leadership candidates have travelled around the country a lot to speak in debates and at press events, it’s nothing like in the U.S. where the voting process is complicated and stretched out for more than a year. Candidates have a $2.5 million dollar spending limit and we have none of that SuperPAC stuff. All the votes come in at the same time from across the country. It’s not like Quebec gets to vote for leader two weeks before Ontario does, having an effect on what Albertan Conservatives might be thinking. This obviously goes for other parties as well. The NDP is also having a leadership race, and while their rules are likely different from the Conservatives, you, as a voting-age Canadian citizen, have the ability and responsibility to make sure the next NDP leader is quality. That’s not just for the sake of the NDP, but for all Canadians. When every party has the best and most palatable ideas and leadership, our democracy is healthier and more representative.